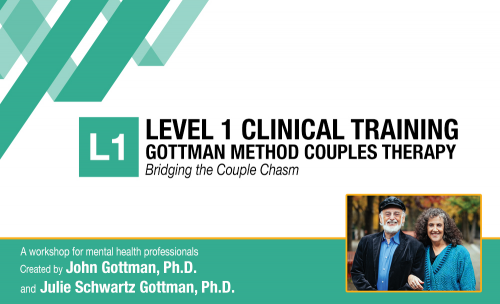 I am pleased to announce that I can offer the Level 1 Clinical Training in Gottman Method Couples Therapy: Bridging the Couple Chasm. This is the first step in learning Gottman Method Therapy! A truly inspiring workshop, Level 1 training will give you new insight into couples’ struggles using research-based assessments and effective interventions. You will receive a 300-page Manual featuring new relationship assessment questionnaires and clinical interventions that you can use immediately with your clients. This training provides continuing education hours (CEs) for Licensed Marriage and Family Therapists (LMFT), Psychotherapists, Psychologists, Social Workers, and other mental health professionals. CE credits are optional and not included in the price of registration. PESI, Inc., Provider #1062, is approved as a provider for continuing education by the Association of Social Work Boards (ASWB), www.aswb.org through the Approved Continuing Education (ACE) Program. PESI, Inc. maintains responsibility for the program. ASWB Approval Period: January 27, 2014-January 27, 2017. Social workers should contact their regulatory board to determine course approval. Social workers will receive 12 clinical continuing education clock hours in participating in this intermediate course. A certificate of attendance will be awarded at the end of the program to social workers who complete the program evaluation. If you would be interested in sponsoring or participating in a Level I Clinical Training in Gottman Method Couples Therapy in your organization, please contact me via my contact page.